I have made cards for several of PTI’s challenges only to find that each challenge only runs for one day! Bummer! I was SURE that the Linky said there were 9 days to go but either I was wrong or they are closing it much earlier than that. Yeah, I guess I didn’t read the challenges themselves correctly. Ugh. This one however, is on time! 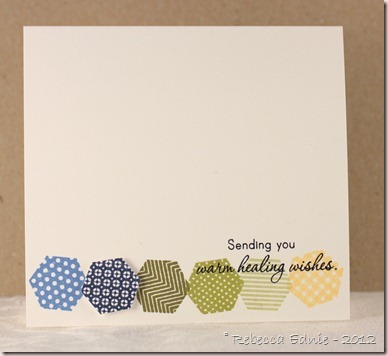 My hexagons were a bit too small for the sketch so naturally, I made the card smaller! It ended up WAY simpler than I normally like but guy cards are hard! I needed one for my FIL and didn’t have one (I made him another I’ll show you later) so it made sense to add to my stash. I used harvest gold, moss, chartreuse, avocado, navy and blueberry sky. I cut out the navy one since stamping it on the die cut made it smaller than the others. And its pretty easy to cut out anyway. Click on the sketch to see the blog post.